Hosted at The Hub at Grand Central Tech, the #REBNYTech Hackathon will bring together 200 of the brightest minds in the property and technology industries for 3 days during NYC Real Estate Tech Week to hack cutting edge solutions to real-world challenges faced by the world’s leading real estate companies. In addition to teams formulating new tech tools, the event will feature speakers from across PropTech and real estate, and it will attract high profile corporate sponsors and organizational partners. In addition to $75,000 in cash and prizes, the event will feature speakers from across PropTech and real estate. After the 3 day hackathon, 6 winning teams will be awarded $2,500 in cash. They will then be given free office space for 3 months to refine their solutions to compete for an additional $15,000, plus prizes worth $20,000. Show off your skills to potential employers. Compete with the best and brightest minds in the industry. Build teams with your PropTech peers. Gather insights from industry panelists and workshop speakers. Compete and illustrate the impact of your innovative ideas. Sponsor the hackathon or a prize and participate in the future of PropTech. The event will provide teams with a suite of data sets & APIs from REBNY and partner companies. The most innovative solutions, as judged by a #REBNYTech panel, will each win cash prizes of $2,500 and free office space for 3 months. The 6 winners will move on to the 3 month Gauntlet Challenge where they will be given opportunity to refine their solutions in order to compete for another $15,000 in cash and prizes worth $20,000. Free food, coffee, and beers will make the weekend extra fun! Email Cindy Ramotar at CRamotar@REBNY.com to learn more. 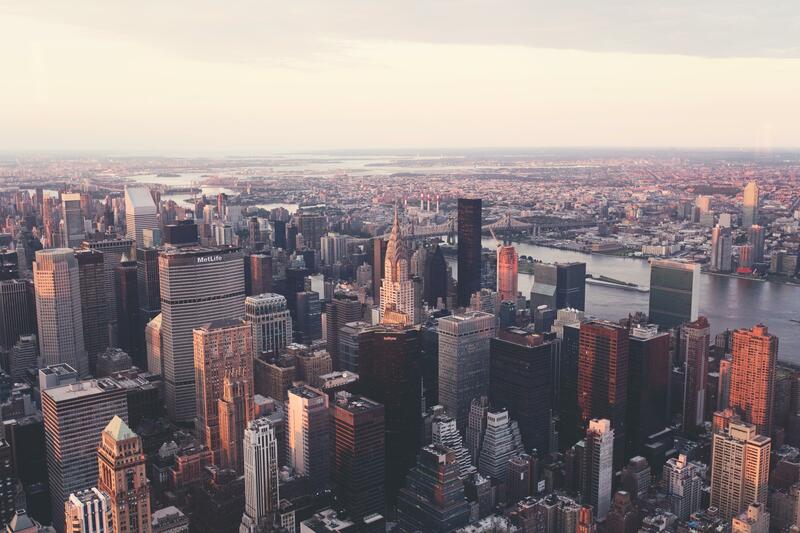 REBNY is the Real Estate Board of New York, Inc. THE REBNYTECH HACKATHON IS VOID WHERE PROHIBITED BY LAW. BY PARTICIPATING, YOU AGREE TO THESE TERMS AND CONDITIONS. NO PURCHASE IS NECESSARY TO ENTER OR TO WIN. A PURCHASE WILL NOT INCREASE YOUR CHANCES OF WINNING A PRIZE. VOID WHERE PROHIBITED BY LAW. The REBNYTech Hackathon begins at 6:30 PM EST on October 13, 2017, and ends at 6:00PM EST on October 15, 2017. Eligibility: The REBNYTech Hackathon is open to individuals who are at least fourteen (14) years old. Participation in the REBNYTech Hackathon constitutes Participant’s full and unconditional agreement to and acceptance of these Terms and Conditions (“Terms”). The term “you” refers to you, the “Participant”. • Create and develop innovative solutions across one of the six (6) stated challenge categories (“Entry”). Identical versions of data sets and tools will be provided to all Participants. • Participants may only submit one Entry in total, either individually or as part of a team. Incomplete Entries may be disqualified in the discretion of the judges. • Each team or individual Participant must supply his/her own laptop to participate. • Each Entry must be submitted under one of the following six categories: AEC & Development; Brokerage; Cybersecurity; Geospatial Intelligence; Sustainable Maintenance & Operations; and Open Hack. Scoring of Entries: A panel of people with relevant expertise will be responsible for judging Entries. The Entry that earns the highest overall score in each of the six categories will win the REBNYTech Hackathon challenge for that category and qualify for the three month Gauntlet Challenge. The decisions of the judges will be final. In the event of a tie, judges will deliberate to determine the winner based on the above disclosed criteria. All entries must be received by 2 pm EST on October 15, 2017. Judging will start at approximately 1 p.m. EST on October 15, 2017 and continue until 4 p.m. EST, on October 15, 2017. Each Participant or team must be available during the judging period to demonstrate the Participant’s or team’s Entry. Judging will be conducted in a “demo day” format, with a series of Participant presentations during the judging period. Gauntlet Challenge: Following the selection of the winners of the REBNYTech Hackathon challenge, the six (6) REBNYTech Hackathon winners will be eligible to compete against each other in a three (3) month Gauntlet Challenge to solve real-world challenges faced by the world’s leading real estate companies. During these three months, the winners will be allowed to refine their existing REBNYTech Hackathon Entries to meet at least one of the provided real-world challenges and to provide the revised Entry to the judges prior to a date and time established by the Sponsor. The Participant whose Entry is found to most effectively address a provided real-world challenge by the judges in the Gauntlet Challenge will receive a material prize to be disclosed on the day of the Gauntlet Challenge’s conclusion. The disclosed criteria and tie breaking procedure for the REBNYTech Hackathon will apply to the Gauntlet Challenge as well. The decisions of the judges will be final. Additional Rules: The judging period may be extended by Sponsor for any length of time, in Sponsor’s sole discretion. If a judge or Participant identifies to Sponsor a conflict of interest, that judge may be recused from judging the Entry with the conflict and an alternate judge may be identified as a substitution for the conflicted judge, in Sponsor’s discretion. Participants will not be eligible for the free office space prize if they are using space affiliated with any Urban Tech NYC Initiative during the REBNYTech Hackathon. Each Entry must be original, of the Participant’s or Participant’s team’s own creation and newly written during the REBNYTech Hackathon and must not have been entered in any other competition or program similar to the REBNYTech Hackathon, including other competitions conducted by Sponsor. “Newly written” means that Participants cannot in any way copy software code that already exists, and submit it as part of an Entry. Entries may be subject to a due diligence review at any time for eligibility and compliance with these Terms. Determination of eligibility and compliance is at the sole discretion of Sponsor. Sponsor reserves the right to disqualify any Entry if the Entry or a Participant or any member of a Participant’s team does not comply with any these Terms. Ownership of Entries: Participant represents and warrants that the Entry does not violate any agreement or obligation to any invention assignment, proprietary information, confidentiality, non-solicitation, noncompetition or similar agreement with any employer or other person. Participant represents and warrants that the Entry is and will be Participant’s own original work and does not and will not infringe the intellectual property or proprietary rights of any third party, including, without limitation, any third party patents, copyrights or trademarks. Participant hereby agrees not to instigate, support, maintain or authorize any action, claim or lawsuit against the Sponsor, or any other person, on the grounds that any use of a Participant’s Entry, infringes any of Participant’s rights as creator of the Entry, including, without limitation, trademark rights, copyrights and moral rights or “droit moral.” Sponsor will have all rights to publicly display, publicly perform, and broadcast, in whole or in part, any Entry, in any manner without further compensation during and after the REBNYTech Hackathon. At Sponsor’s request and expense, Participant will assist and cooperate with Sponsor in all respects to execute documents, and will take such further acts reasonably requested by Sponsor to enable Sponsor to acquire, transfer, maintain, perfect and enforce their intellectual property rights and other legal protections for the Entry. Participant hereby appoints the officers of Sponsor as Participant’s attorney-in-fact to execute documents on behalf of Participant for this limited purpose. Nothing herein shall constitute an employment, joint venture, or partnership relationship between Participant and Sponsor. Participants will not receive any compensation from Sponsor in connection with any Entries. Each Participant acknowledges and agrees that Sponsor or other Participants or third parties may have developed or commissioned works which are similar to the Entry of Participant or Participant’s team, or may develop something similar in the future, and each Participant waives any claims that Participant may have resulting from any similarities to the Entry of Participant or Participant’s team. Prizes and Awards: The prizes and awards to be awarded as part of the competition are as follows:. The Participant or team whose Entry is awarded the highest score in each of the six categories discussed above will receive a prize to be disclosed on the day of the event. The approximate value of the Gauntlet Challenge prize: $35,000 (U.S.). The odds of winning depend on the total number of eligible Entries received. No cash or other substitution of prizes is permitted, except at the sole option of Sponsors for a prize of equal or greater value. Sponsors will not replace any lost or stolen prizes. Winners are solely responsible for any and all federal, state, provincial and local taxes, if any, that apply to prizes. 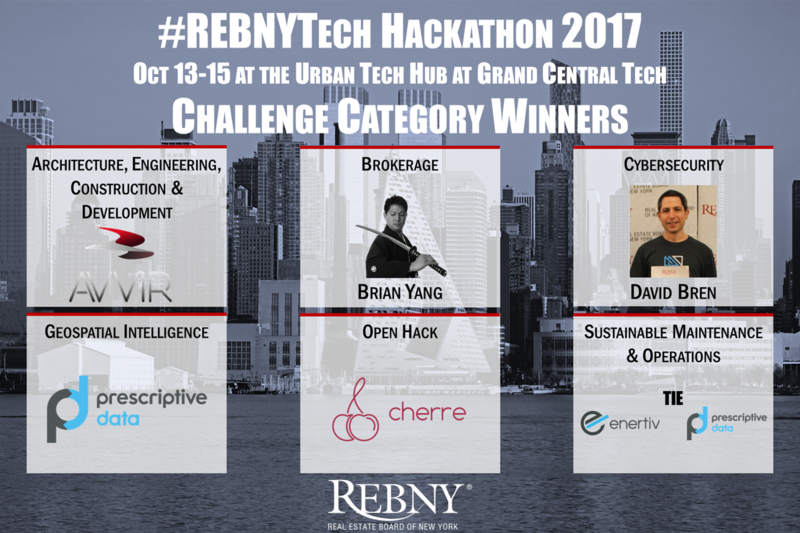 Winners of the REBNYTech Hackathon will be notified by 6 pm EST on October 15, 2017, and may be required to sign and return an affidavit of eligibility and publicity/liability release within seven (7) days of notification and if applicable will be issued a W-9 tax form. If a selected winner cannot be contacted, is ineligible, fails to claim a prize and/or where applicable an affidavit of eligibility and publicity/liability release is not timely received, is incomplete or modified, the prize may be forfeited and an alternate winner will be selected from remaining valid, eligible Entries timely submitted. The same applies to the winner of Gauntlet Challenge, who will be notified in or around January 2018 at a yet-to-be scheduled event. Publicity: Except where prohibited, by participating in the REBNYTech Hackathon, Participant consents to the use of his/her name, photo and/or likeness, biographical information, entry and statements attributed to Participant (if true) for advertising and promotional purposes, including without limitation, inclusion in Sponsor’s newsletters, Sponsor’s website at http://www.REBNY.com, and any of the Sponsor’s social media accounts or outlets without additional compensation. Indemnity: You agree to release, indemnify, defend and hold Sponsor and their parents, affiliates, subsidiaries, directors, officers, employees, sponsors and agents, including advertising and promotion agencies, and assigns, and any other organizations related to the REBNYTech Hackathon, harmless, from any and all claims, injuries, damages, expenses or losses to person or property and/or liabilities of any nature that in any way arise from participation in the REBNYTech Hackathon or acceptance or use of a prize or parts thereof, including without limitation (i) any condition caused by events beyond Sponsor’s control that may cause the REBNYTech Hackathon to be disrupted or corrupted; (ii) any claim than an Entry infringes third party intellectual property or proprietary rights; (iii) any disputes among team members, (iv) any injuries, losses, or damages (compensatory, direct, incidental, consequential or otherwise) of any kind arising out of, arising from, relating to in any way or as a result of the prize, or acceptance, possession, or use of the prize, or from participation in the REBNYTech Hackathon; (v) any printing or typographical errors in any materials associated with the REBNYTech Hackathon; technical errors that may impair your ability to participate in the REBNYTech Hackathon; or (vi) errors in the administration of the REBNYTech Hackathon. DISCLAIMER. IN NO EVENT WILL SPONSOR BE LIABLE TO YOU FOR ANY DIRECT, SPECIAL, INCIDENTAL, EXEMPLARY, PUNITIVE OR CONSEQUENTIAL DAMAGES (INCLUDING LOSS OF USE, DATA, BUSINESS OR PROFITS) ARISING OUT OF, ARISING FROM, RELATING TO OR IN CONNECTION WITH YOUR PARTICIPATION IN THE REBNYTECH HACKATHON, WHETHER SUCH LIABILITY ARISES FROM ANY CLAIM BASED UPON CONTRACT, WARRANTY, TORT (INCLUDING NEGLIGENCE), STRICT LIABILITY OR OTHERWISE, AND WHETHER OR NOT SPONSOR HAS BEEN ADVISED OF THE POSSIBILITY OF SUCH LOSS OR DAMAGE. Some jurisdictions do not allow the limitation or exclusion of liability for incidental or consequential damages, so the above limitation or exclusion may not apply to you. General: The REBNYTech Hackathon is subject to federal, state, and local laws and regulations. The REBNYTech Hackathon is offered by Sponsor, which is not responsible for (i) late, lost, damaged, incomplete, or misdirected Entries, responses, or other correspondence, whether by e-mail or postal mail or otherwise; (ii) theft, destruction, unauthorized access to or alterations of Entries; or (iii) phone, electrical, network, computer, hardware, software program or transmission malfunctions, failures or difficulties. Sponsor reserves the right, in its sole discretion, to cancel, modify or suspend the REBNYTech Hackathon in whole or in part, in the event of fraud, technical or other difficulties or if the integrity of the REBNYTech Hackathon is compromised, without liability to the Participants. Sponsor reserves the right to disqualify any Participant, as determined by Sponsor, in its sole discretion. These Terms are governed by the law of the State of New York, without reference to rules governing choice of laws. Any action, suit or case arising out of, arising from, relating to or in connection with, this REBNYTech Hackathon and/or the Terms must be brought in either the federal or state courts located in the New York, New York. Sponsor’s failure to enforce any term of these Terms shall not constitute a waiver of that provision. Winner’s List: For a list of winners, send an email message to RBaxter@REBNY.com with “REBNYTech Hackathon Winner’s List” as the email subject and REBNYTech Hackathon name specified in the body of the e-mail. Startups must employ fewer than 50 staff. Save 25% when you register a team of 5 participants. Startups must employ fewer than 50 FTEs. Save 25% when you register 5 participants. Join us on Sunday for demos and networking with included breakfast, lunch, pizza, wine and beer.